Phones aren't just for calling anymore, and we bet that even your grandparents are well aware of that. Instead, taking photos is what smartphones are used for the most, as recent surveys have shown. And that should come as no surprise: most high-end smartphones can capture images so good that they are well capable of replacing an entry-level point and shoot camera. 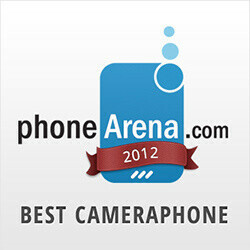 Therefore, including a 'Best Cameraphone' category in our PhoneArena Awards of 2012 seems quite logical to us. The best cameraphone of the year may be nothing impressive as a phone, but its photographic abilities are yet-to-be-matched by another handset. It is a product that required years of research, and the results are very impressive indeed, we have to admit. Perhaps our frequent readers already know what smartphone we have in mind. This wasn't too hard to guess, was it? Without a doubt, the Nokia 808 PureView is the year's best cameraphone - so good that it is commonly regarded as a point-and-shoot camera replacement with some phone functionality built in. And it isn't only about megapixels, altough with 41 of them, one can capture incredibly detailed images. (For a phone, that is.) You get features like lossless zooming - none of that digital stretching non-sense, both when shooting still photographs and while capturing video, even at 1080p. Moreover, the camera is smart enough to manipulate those millions of pixels and combine them producing a 5 or 8MP image that no other cameraphone can recreate. Yes, the iPhone is on our podium for a second consecutive year, this time occupying place number two. And rightfully so as it is still one great cameraphone. Not only that photos taken with it look great under most conditions, but the camera interface is extremely easy to get around, while the camera app launches in a split second. What's more is that with the iPhone 5, Apple added panorama mode to the list of camera features capable of producing seemlessly stitched photographs at up to 28 megapixels. There was fierce competition for the third place in today's cameraphone category, yet ultimately, the Samsung Galaxy S III took over the spot. And it well deserves to be honored for a number of reasons: first of all, it takes detailed, true-to-life photos under most conditions, with virtually non-existent shutter lag. Moreover, you get a ton of handy features, such as the ability to take 20 shots in burst mode and then pick the best one among them and to snap full-res stills while shooting 1080p video. And there you have it, ladies and gentlemen: the Nokia808 PureView is the cameraphone of the year, followed by the iPhone 5 and the Samsung Galaxy S III. 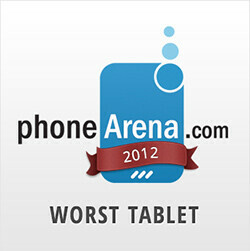 But keep in mind that we aren't quite done yet with the PhoneArena Awards of 2012. The next category will be annonced in 24 hours so stay tuned! where is lumia 920 ??? Was about to ask, but they didn't like it that much in that comparison that was posted a couple of days ago. Maybe so, but their own "920 vs 5" comparison had the 920 coming out on top excepting still image detail for auto modes. OHHHHH C'MOOOOOONNNNNN........ this article FORCED me to sign in and coment about how biased this article is. i dont really think this is iphonearena or samsungarena, but i am damn sure they have some grudges with nokia and MS. 90% of the article here directly or indirectly bash both nokia & MS. I used to love this website but now it just makes me sick. So what, what's the big deal? Looks like NickT doesn't like MS and Nokia, what's you're problem? wait.. this article is bashing nokia..? So.... did they give a NOKIA THE WIN because they felt sorry for bashing it? Did you even read? The pureview by NOKIA won. It had nothing to do with OS.. since it runs Nokia's now dead OS, but its by far the most superior camera. It would have won regardless if it was on WP8, Android, Meego, or Bada. REALLY?!?! The iPhone 5's there and the Lumia 920 isn't shown? This is so messed up!!!!!!!!!!!!!!!!!!! They who ??? iPaid Reviewers ??? gotta give them iPhone 5, but I can't accept the fact that 920's not included here. It has the best low light capabilities. superb IOS. what i dont understand is how the iPhone 5 got 2nd place when it was already reported to have the purple glare in their pictures! S3 doesn't have it. 920 doesn't have it. And trust me, for your sake, I did my research prior to this. whysoserious he wont trust u ... he only obey orders from apple inc. What!!! Am I reading this correctly? MeoCao actually said something not anti about the iPhone. There's hope for u after all n the land on fairness lol. Just kidding man... Gs3, and iPhone r a tops up for 2nd. LOL, I never complained about iPhone 5 camera except the purple flare which turned out to be normal for most phone cameras. I am flattered! Meo you are thinking rationally!!! Nah, Xperia T over the iPhone 5. It has a CAMERA BUTTON! Makes sense for a camera phone. And a better camera overall I think. Especially tweaked with non-official mods. A shutter key (2-way at that) is ABSOLUTELY essential in a "camera-phone"
Oh wow...panorama, so cutting edge...NOT. I've owned several dumbphones that have panorama capabilities. I don't usually accuse PA of bias (except when it comes to the original Palm Pre review) but this list is seriously messed up. The 920 didn't even crack the top 3? Ridiculous. If Samsungarena was as catchy as iPhonearena, I'd use it to describe them right now. The reason it's not included is beacuse it has great low light photography, but sub-par daylight photography. The iPhone 5 and GSIII beat it hands down during the day light and still have good (but not as good as the Lumia 920) night time photos.